Scuba diving in Cozumel Mexico- who’s in? Join us for fun scuba dive trip. Spend a week exploring the exciting dive sites in the reefs around Cozumel. Famous for its drift dives, you will experience everything from a “flying drift dives” to amazing wall dives. There is something for every diver. Our host hotel is Scuba Club Cozumel. The resort is designed by divers, for divers. 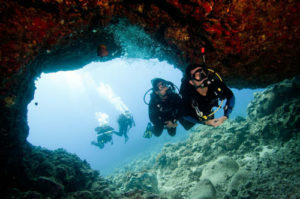 The dive center is located at the resort and is a PADI 5 Star Dive Center. Located within easy walking distance from the center of town, you can explore the shops and enjoy the activities and restaurants in the town square. Hotel to Airport Ground transfers are not included. $2.50 per diver, per day Marine Park fee paid direct on island. Non-refundable deposit of $200 reserves your space. Single and Triple occupancy rates available on request. Contact Carolyn for more information or to reserve your space.